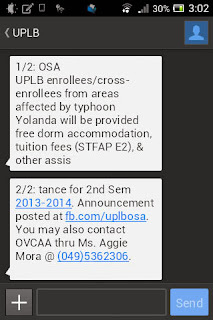 All UPLB students that have OSAM profiles regularly receive messages that are of public interest from the Office of Student Affairs. OSA would like to emphasize that receiving SMS from OSA is a privilege and disseminating information through SMS is not a mandate of the office. OSA is simply helping disseminate information. In special cases and when SMS credits are available, OSA may also disseminate the information through SMS as it deems necessary. OSA is a service unit utilizing various information and communication technology tools to provide an efficient and effective student service but OSA is not an advertising agency, thus, it does not simply send out announcements when requested. Not receiving announcements from OSA? Make sure that you have you have an updated OSAM profile. OSA can only send SMS to Globe and Smart subscribers at this time.